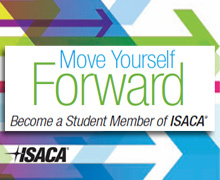 ISACA Student Groups (ISGs) encourage education beyond the classroom by allowing students to network and learn from each other, and connect with a supportive group of professionals. While ISGs do NOT require ISACA Student Membership, an ISG gives students the opportunity to get to know ISACA by interacting with professionals at events sponsored by the university and the local chapter. By participating in an ISG, students gain knowledge and experience that moves them ahead of the competition when they graduate. The ISACA Student Chapter of TEI of Thessaly, under the supervision and guidance of the Greek Chapter of the organization in Athens and the Academic Advocate Dr. Vasileios Vlachos accept applications for new members.